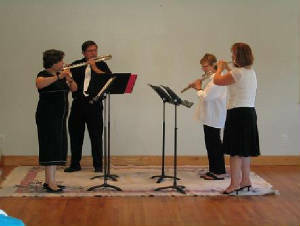 Blackledge Flutes at the Joseph N. Goff House Museum & Cultural Center, East Hampton, CT. Peter Standaart,Helene Rosenblatt,Leonor Snow, Heather Wagner. 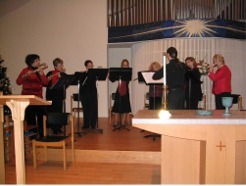 2006 NBMAA concert with BLACKLEDGE Woodwind Quintet and Salmon Brook Trio. 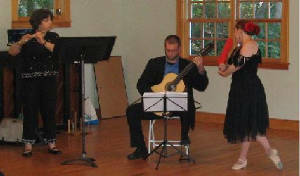 Collaboration with Alison Bogatay of Allonge Dance Variations at the Goff House 2009. Help support Blackledgemusic,Inc. 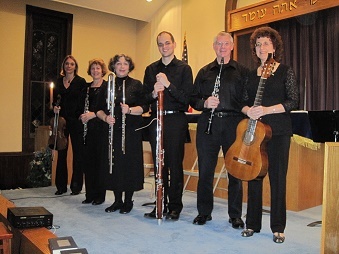 we want to do more concerts in small museums, landmark locations, historic sites and make a welcoming win-win situation for culture.